The MCP466X devices are dual channel, non-volatile, 8-bit (257 wiper steps) digital potentiometers with EEPROM and an I2C compatible interface. The MCP466X family is available with end-to-end resistor values of 5KΩ, 10KΩ, 50kΩ and 100KΩ. These devices offer WiperLock™ Technology which allows the user unlimited reprogramming and locking of the wiper setting. It is useful for equipment that requires factory trimming or recalibration. 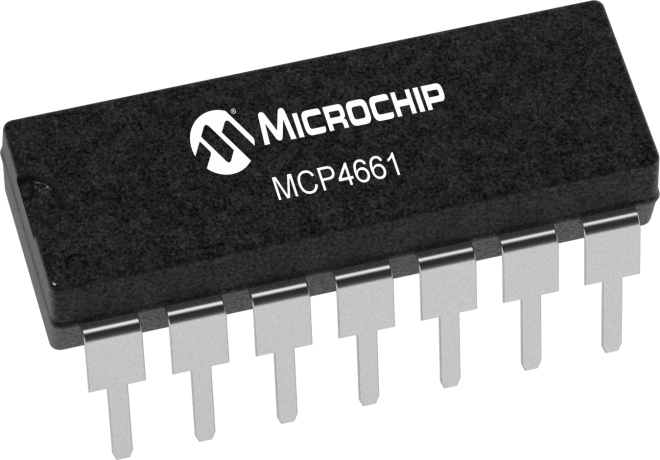 The MCP466X devices offer a variety of configurations simplifying design while minimizing cost, package size and pin count. The 14-Lead SOIC/TSSOP/DIP Evaluation Board allows the system designer to quickly evaluate the operation of Microchip Technology’s devices in either SOIC, DIP, or TSSOP packages.